After grabbing the keys and taking a tour of Vanna (she was a beaut and everything we could have asked for), we hit the road to Cannon Beach.... 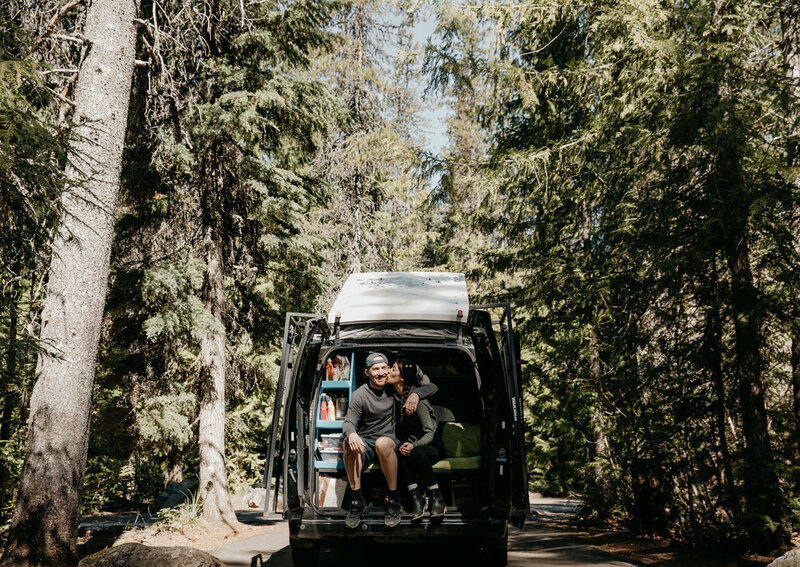 This trip itinerary comes to us from Sarah Valencia and Adam Pellegrino, two happy campers that took Vanna (a Nissan conversion van) out for an adventure in Oregon. Thanks for all the tips Sarah! We hopped on a late night flight from Denver the day before and crashed at a nearby no frills hotel in Portland. After getting some much needed shut-eye, we woke up to a text from Vanna's owner, Tracy, saying to head on over whenever to pick-up our camper van. To say it simply, we were absolutely stoked. After grabbing the keys and taking a tour of Vanna (she was a beaut and everything we could ask for), we hit the road to Cannon Beach. There were so many options for places to explore on the Oregon coast but Haystack Rock was at the top of the list. The drive to the coast was incredible. The lush trees and winding roads with Tom Petty on the radio gave me some serious adventure feels. Arriving at Cannon Beach, we walked the small town along the coast, grabbed some beers at Pelican Brewing and made a dinner to take down to the beach and catch the sunset. The wind, the golden light, the massive rock formation with the waves crashing against it... it's something forever imprinted in my memory. We hit the road early in the morning and headed east towards Mt. Hood National Forest to grab a spot at Lost Creek Campground. Our campsite was perfectly tucked away in the towering trees with other campers scattered far enough away that you felt like no one else was around. We popped the top on Vanna and made some lunch before heading to Burnt Lake Trail for some hiking. Vanna really has all the things you could need in a camper van. The stove + sink combo pulls out of the van so you can have more room to cook or wash dishes. Attached to that is a table that pops up if you need more cooking space. Inside is a convertible couch + bed so it's perfect for an easy sitting or sleeping option. Not to mention, Vanna is stocked with all your cooking and camping needs. Hiking into Burnt Lake Trail makes you feel like you have walked into a different time and place with the huge trees and peaceful forest. A storm lingered overhead with thunder booming through the mountains as we trekked through our hike. It was a total surreal adventure. With tired legs and the sun creeping down the sky to set, we headed back to Vanna to make dinner and relax around the campfire. Lost Creek was honestly one of my favorite campgrounds. It was tucked away right by the creek and you could hear the rushing water right outside the camper van. Best night’s sleep a girl could ask for. We woke up early to head to Trillium Lake to get our kayak rentals for the morning. With not a ton of time to make coffee (like I said, it was a solid night's sleep) we stopped off at Mt. Hood Roasters to try out the local coffee spot. 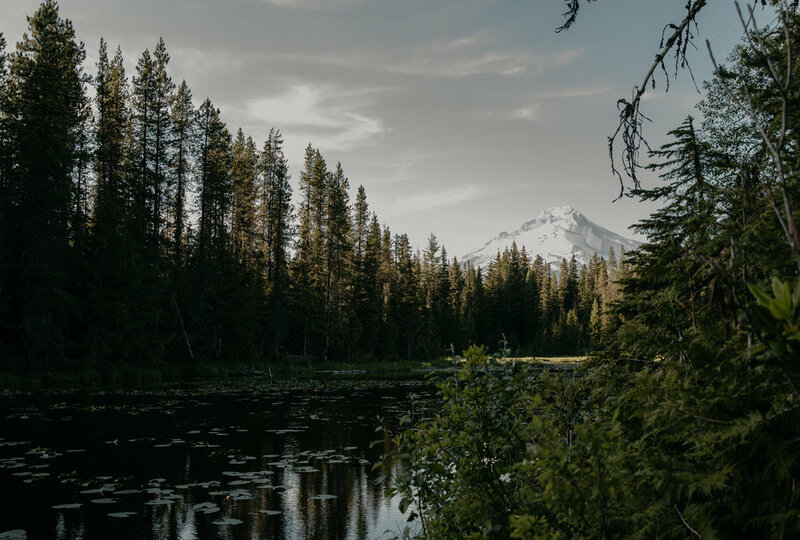 We rolled up to Trillium Lake just in time to catch Mt. Hood’s reflection on the lake in all her bluebird glory. After some kayaking, we took Vanna down a windy road to Salmon River Trail. I thought the trees at Lost Creek were massive, but these by far were the biggest I'd seen. As the wind blew through the forest you could hear the creak of the trees swaying and the moss fluttering off them. Of any trail, this one stole my heart. It was our last night with Vanna staying at Trillium Lake Campground. We made a feast of a dinner and then made our way down to the amphitheater to check it out. We took Vanna down and around the lake to watch the sunset on Mt. Hood. It was an evening for the books and an epic way to end our road trip. Our time with Vanna was coming to a close so we made some coffee and hit the road back to Portland to return Vanna. Oregon really is one incredible place. With lush forests, peaceful hikes, beautiful mountains and the most friendly, chill locals... it was more than I expected in every way. I have a feeling that Oregon will be a place I'll be visiting again soon and I will definitely be taking Vanna for another spin. To rent Vanna, click here or the Reserve Now button above.